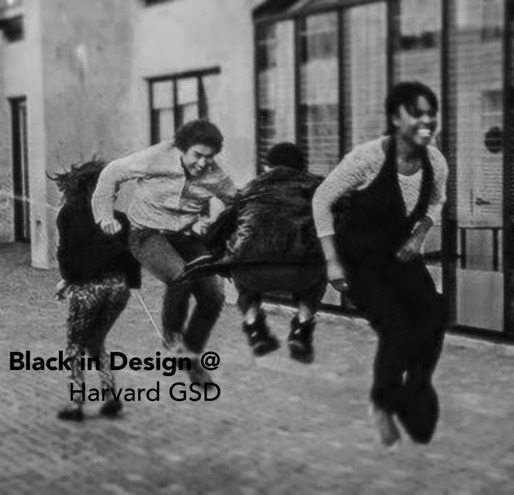 Black in Design is a conference organized by Harvard Graduate School of Design’s African American Student Union (AASU), coming up on October 9-10, 2015. The conference is by, for, and about African descendants in the worlds of architecture and design. But it’s also about the larger role of design in shaping our material culture and the responsibilities that we all share. I sat down with conference organizers Courtney Sharpe and Cara Michell, both members of the GSD’s Master of Urban Planning class of 2016, via text chat to learn more about the conference and the current state of diversity conversations at the GSD. LC: I just got the GSD's very pink Fall lecture poster in the mail. What’s your take on it? CS: I was digging the pink and purple! And I'm excited by this fall's lecture series. Last year I wasn't interested in as many of the speakers but I feel like there's greater diversity of topics coming up. LC: I imagine that the AASU's work to foreground diversity issues helps keep this on everyone's mind. CM: Yes, hopefully! I’ve seen some new developments. On the academic side of things, we have the “MLK Way: Building on Black America’s Main Street” studio this fall, which is the first course I’ve seen outside of core studio foregrounding issues of race and social justice. The financial and administrative support that the GSD has recently given to the AASU is also a new thing. 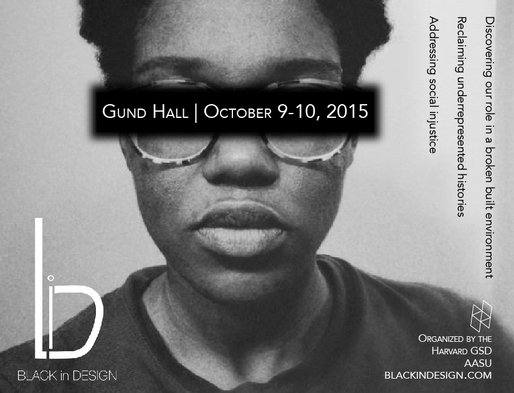 LC: And of course there’s your upcoming Black in Design conference. What is its goal? CS: First, we want to provide a platform to showcase the work of Black designers and other practitioners whose work positively impacts Black communities. CM: Our second goal is to expand the definition of what design is and what it can do for issues of social equity beyond the GSD’s dominant discourses in architecture, landscape architecture, and urban planning and design. LC: In terms of formalism? CM: Formalism in a vacuum. CS: Yes. And third, we want to introduce a younger and broader audience to the field of design in hopes of inspiring new career paths and opening conversations for cross-disciplinary collaboration. We've allotted 25 tickets for high school students to attend for free, including 11 local students from the Urbano Project, and a group of 6 students from New York’s Made in Brownsville. LC: Super. How do you think about these different goals--one focused on a specific community and one extending outside this community? LC: In terms of this community-centric aspect, how would you describe the current state of the Black design community/communities and what kind of bridges do you hope to build there? CM: We can speak most specifically about the Black design community within the GSD. We are unfortunately at a point with the AASU where we do not know what our future will be. Only 5 of 10 newly admitted Black students at the GSD actually enrolled for the 2015-16 academic year. The majority of the AASU leadership will also graduate this year. LC: How many AASU members and leaders are there currently? CM: We currently have 10 members in leadership roles and about 5-7 additional members who are regularly active in the group, and maybe 50 more who are on our listserv and attend/volunteer at events. CS: Part of the leadership issue is that most of the board is comprised of students in urban planning, which has the highest percent of African Americans, and as a two year program it’s much shorter than the M.Arch. That is an interesting phenomenon--the fact that the Master of Urban Planning (MUP) program is able to attract and offer admission to more Black students than the other degree programs definitely impacts the lived experience at the GSD. There’s speculation that part of the reason why there may be more MUPs is that it’s one of the few programs that doesn't require a portfolio--so the barriers to entry, while still high, don’t require as much in terms of previous specialized experience. LC: Do you think that part of it is that young Black people who are into design and the built environment see urban planning as a more viable way to make an impact than, say, architecture or landscape? CM: It’s possible. I think that barriers with unpaid (and underpaid) internships, and the cost of materials for architecture and landscape studios might also be a factor. CS: So this decline in our numbers at the GSD is an extra impetus for our goal to expand our outreach to include younger and broader audiences, to reach people who might like to do this kind of work but have yet to be exposed to it. For people who see changing the built environment as part of the solution but who did not study architecture in undergrad, it could be daunting to take on that skill-set on "later" in life. LC: And this fuels the disproportion because architecture undergrad programs tend to have more Whites and Asians, and fewer Blacks, Hispanics, and Native Americans. CS: Yes. That said, many of the urban planners in our program, of all nationalities and ethnicities, DO have design backgrounds and made a decision to shift to planning. LC: Whatever the reasons, these declining numbers certainly add some urgency to your efforts. CS: Yes! The survival of a culture of Black designers depends on widening this funnel--getting more young people interested, helping more to apply and attend, etc. LC: What about Black design culture outside the GSD? CS: I'm not as immersed in that world yet. What I can say is that BosNOMA, the Boston chapter of the National Organization of Minority Architects (NOMA), has been very supportive. They had us present at one of their summer meetings and their Co-Chair, Racquel Davey, is volunteering at the conference. GSD alumni have also been very supportive. Some, like you, have found us through Twitter and have been offering connections, stories and advice. It's been great. 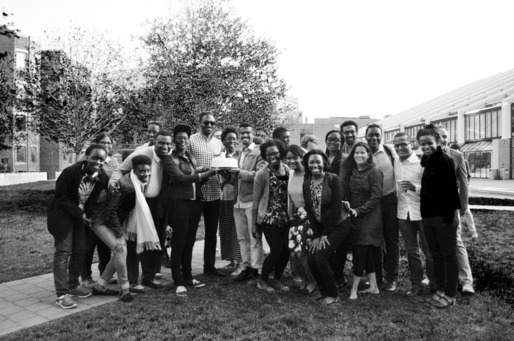 One alum reached out and shared with me a bit about the GSD’s Social Change and Activism (SoCA) group. Was that around when you were there? I understand that some of their key people were from South America and Africa. LC: Yes! SoCA was around. Archinect’s Quilian Riano was involved, and Quardean Lewis-Allen, I believe. CS: The alumni who have reached out to us have been generally excited for us and that's so cool. Some have also shared that these issues we're fighting are, unsurprisingly, not new. Part of what we need to do is increase institutional memory. It's easy to ignore students because they'll be gone in a few years, but when numbers get so low that the groups fade away, only to have to be reinvented later, it's hard. The ‘new’ group has to reinvent the wheel. CM: We're also hoping that the conference might help increase enrollment rates of Black students who are admitted. The GSD seems to want to help with outreach, but in terms of reaching out to alumni, FERPA regulations create barriers. We wanted to create a database of Black alumni, but the school says it doesn’t even track that information with regards to its alumni. LC: You've had success on Twitter and it seems that social media, on an opt-in basis for everyone involved, seems like a good way to get around these legal and technological barriers. LC: One question I have is about the relationship between AASU and the rest of the GSD, and between students of different colors and backgrounds. For example, how does it work for students who are not Black or of African descent to participate in the AASU--does that get controversial or challenging? CS: Not in my experience. They are completely welcome. We recently wrote down our constitution and there are no race requirements for membership or leadership in the group. One of our current executive members is Latina. I think it's a self selecting group--and again, many of them are Planners! We are so small in number, so having people show up in solidarity has been warmly welcomed. That said, no one who has come has been forceful about taking things over. It's been respectful and mindful. LC: Cara mentioned that AASU has recently started getting financial and administrative support from the GSD. Can you tell me about that? CS: Let’s divide that in two--the AASU and the BiD Conference. Like most student groups, the AASU gets funding from Student Forum which allocates funding to groups by application from the student activities fee that each student pays. The BiD Conference has a separate budget, which has received funding from various GSD offices. For example, the communications office is covering the cost for our space and tech needs during the conference as well as making the travel arrangements for our speakers which is a huge help. We’ve also undertaken a significant fundraising campaign. This is not the GSD's conference, it is ours. LC: So you, and not the GSD, assembled the speakers and organized the schedule. CS: Yes, and we’re really excited about the diversity of speakers! It's not just architecture and planning. We'll have interior designers, a photographer, food historian, historic preservationist, agriculturist, eco-fashion designer, etc. During the interludes we'll have poetry, dance and singing! This conference is also a celebration. LC: Are the conversations still built-environment-centric? Your blurb talks about scales ranging from the building to the city, region, and globe. CS: We’re thinking of "design" as broader than the limits of the fields of study at the GSD and we want to increase interaction between disciplines. So the focus is on the built environment, but we’ll open the conference with workshops that play with the idea of the “body as a scale” because if not for each of us in our respective skins, there would be no experience. LC: How many people are you expecting? CS: The full capacity of Piper is 400, so that's our goal. LC: Love it! Thank you so much for your time! ...And thank you for reading! 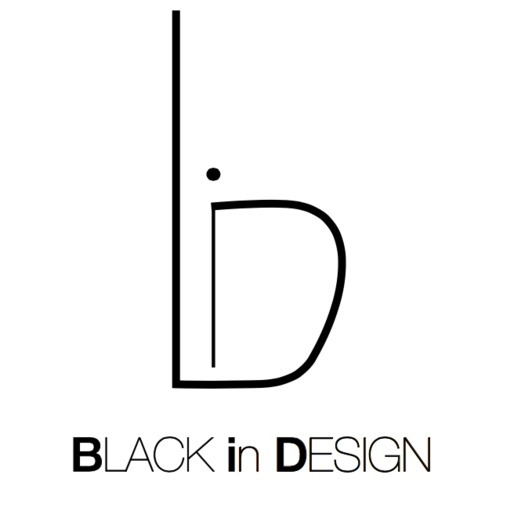 Join the Black in Design LinkedIn group. Follow the Harvard GSD - AASU on Twitter to get updates about the conference live stream. You can also sponsor the BiD conference or future AASU activities. P.P.S. It's been a while since I've blogged, in part because I've changed jobs and am now doing data viz design at the SF-based fintech startup Earnest. It's not at all architecture-related, and I have thoughts on this which I'll share in a future post. The future is here, and the future is terrifying. Trimble and Microsoft's HoloLens.